Posted on Thu, Mar 1, 2012 : 4 p.m.
Head to the "Jazz and Chocolates" scholarship fundraiser weekend in Chelsea. Friday, 6 to 8:30 p.m. At Silver Maples, there will be chocolate desserts, raffle items and performances of jazz, blues and American Songbook Standards. Saturday morning, there will be jazz workshops for the kids. Learn about them by calling 734-475-8732 ext. 4 or at www.chelsea.lib.mi.us. On Saturday, at 7 p.m., there will be a jazz concert featuring the Royal Garden Trio and others in the Chelsea High School Auditorium. $10 per person/per event, available at Chelsea Pharmacy, Chelsea Center for the Arts, or at the door of both events. Silver Maples is at 100 Silver Maples Dr. CHS is at 740 N. Freer Road. "Sgt. Pepper's Lonely Hearts Club Jam" will be at the Blind Pig on Saturday. It's time again for the "Annual Jazzistry Rent Party" at the EMU Student Center. Doors open at 7:30 p.m. This year's event includes a musical tribute to New Orleans and, back by popular demand, a cabaret-style showcase of dancing favorites. $30/adults, $15/students. Order by phone by calling 734-761-6024. The EMUSC is at 900 Oakwood St., Ypsilanti. 734-487-3045. Brewed Awakenings in Saline will hold a "One Year Anniversary Party" on Saturday. 9 a.m. to 8 p.m. There will be events all day, including scone, sandwich and cookie tastings, raffles and a band. There will be tastings every hour. No cover. Brewed Awakenings is at 7025 E. Michigan Ave. Suite M, Saline. 734-681-0078. "Sgt. 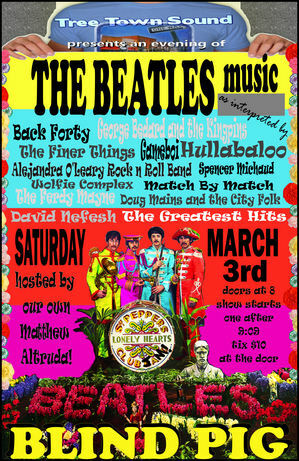 Pepper's Lonely Hearts Club Jam" will be at the Blind Pig on Saturday. 8 p.m. (doors, 7:30) Bands such as Back Forty, George Bedard and The Kingpins and many more will interpret the Beatles songbook as you've never heard it before. $10 for those 21 and over; $13/ ages 18-20. Half-price admission for fans named Sadie, Rita, Pam, Michelle and Prudence. Half-price admission for fans age sixty-four and up. ID required. The Blind Pig is at 208 S. First St., Ann Arbor. 734-996-8555. There will be a "Hurricane Katrina Benefit" at the West Side United Methodist Church on Saturday. 7 p.m. After seven years, volunteers are still needed, and they’re the only help being given to restore the greater New Orleans area. Come to the church's Coffee House for dessert and live music. Free, but donations are needed. The church is at 900 S. Seventh St., Ann Arbor. 734-663-4164.